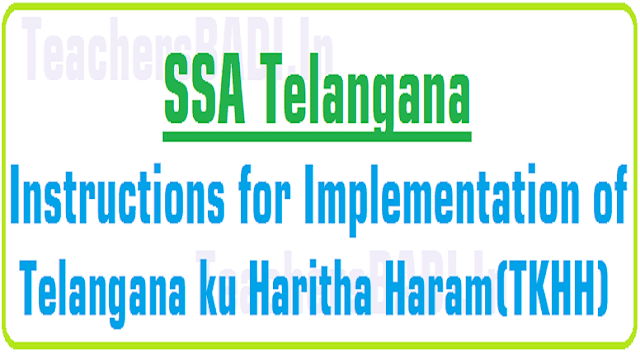 Instructions for Implementation of Telangana ku Haritha Haram(TKHH): DSE Telangana, Rc.No.77, Dt. 30-07-2016. Sub:- School Education - Haritha Haram - Implementation of Telangana ku Haritha Haram(TKHH) in the State - Review meeting conducted by the Chief Secretary to Govt. on TKHH programme - Minutes - certain instruction issued - Reg. Sub:- School Education - Telanganaku Haritha Haram Programme - Plantation to Saplings - Improve the performance in certain Districts - Instructions issued - Reg. Ref:-1) This office proc.Rc.No.77/PS2-1/2015, dated.10.07.2017. 2) D.O.Lr.No.4754/SE.General/Al/2017, dated.10.07.2017 of the Special Chief Secretary to Government, School Education Department, Telangana Secretariat, Hyderabad. 3) This office proc.Rc.No.77/PS2-1/2015, dated.11.07.2017 & 12.07.2017. 4) Govt.Memo.No.4754/Genl/Al/2017, dated:l0.07.2017 along with email from the Forest Department, dated:l0.07.2017. 5) This office Proc.Rc.No.77/PS2-1/2015, dated:14.07.2017 & 18.07.2017. 6) Department wise weekly progress report, dated:24.07.2017. 8) Govt Memo No.4754/Genl/Al/2017, dated:24.07.2017. The attention of the under mentioned District Educational Officers is invited to the references read above, and they are informed that the Telanganaku Haritha Haram is a flag ship programme of the State Government to increase the coverage of Greenery in the State. To achieve the same, they have to undertake massive plantation programme in every possible open space in and around the school premises also. But as the Weekly Report furnished by the District Educational Officers (Details enclosed) it is observed that, the performances of the under mentioned districts are below state average. motivate the school children of all the schools under all managements in their districts to take up plantations in large scale during wet spell of this monsoon and ensure 100 % survival of plants with tree guards / fencing and improve the performance in the district. 1) Govt Memo No. 1145/SE.Gen/A1/2014 , Dated: 11.03.2015. 2) Govt Memo No. 1145/SE.Gen/A1/2014, Dated: 10.12.2015. 3) This office Proc.Rc.No.77/PS2-1/2015,Dates: 29.12.2015, 03.05.2016, 03.06.2016, 14.06.2016,16.06.2016, and 06.07.2016. 4) Govt Memo No.1145/SE.Gen/A1/2014 , Dated: 02.07.2016. 5) Lr.No.1120/for.1(2)/2015 Forest Dept. Dated:01.07.2016. 6) Govt Memo No.16085/OP & MC/A2/2015 , Dated: 06.07.2016. 7) Lr.No.1120/for.I(2)/2015, Dated: 22-07-2016 from Principal Secretary to Govt. Forest Dept. All the District Educational Officers in the State are invited to the reference 7th read above, and they are informed that the Chief Secretary to Govt. reviewed district wise department wise performance under TKHH during the Video Conference and directed all District Collectors to prepare a Micro – Plan for maintenance and monitoring for plantation taken up in each village. The Micro Plan shall content site of planting, status of protection of seedlings planted by putting brush wood fencing and watering of the plants till next summer. The Micro Plan shall be detailed including funds requirement vis-à-vis availability at District level, additional fund requirement, person in-charge of seedlings planted, water source, mode of transport of water, frequency of watering etc. A draft format for preparation of Micro Plan at Village level and Municipality / Corporation level is enclosed herewith for guidance and District Collectors may revise the same as per necessity. The draft Micro Plan shall be prepared latest by 26.07-2016. The silent features of the discussions for School Education Dept. are as follows. a) No. of plants to which brush wood fencing required. b) No. of plants to which fencing provided under MNREGA and other schemes. c) No. of plants are to be protected for which additional fund required at village / Municipality level. d) Funds required for brush wood fencing. e) Funds available at Village / Municipality level under NREGS or other schemes. f) Additional funds required for brush wood fencing. a) No. of plants to which watering facility to be given. b) No. of plants for which watering facility provided under MNREGA and other schemes, fire tenders, tankers with urban body / Panchayats / Municipality etc. c) No. of plants are to be processed to achieve the target for which additional fund required at village / Municipality level. d) Funds required for watering upto June 2017.
e) Funds available under MNREGA and other schemes. f) Additional funds required for watering upto June 2017.
i) Distance from which water would be transported. Further, they are informed that the District Planting Progress proforma and requirement of Funds for protection and watering of seedlings upto June 2017 proforma under TKHH proformas is here with enclosed. Therefore, all the DEOs in the State are requested to take further course of action as per Micro Plan for maintenance of plantations in Gram Panchayat/ Municipalities duly consulting the concerned District Collectors for implementation of TKHH programme in respective Districts and submit a copy of the Micro Plant to this office within a week positively.